Gold prices hit a high of $1290 yesterday after the US ADP report showed that non-farm private employment growth was below expectations in February at 183,000 vs 189,000. However, the yellow metal was set back by a firmer Dollar, which makes the dollar-denominated asset more expensive to foreign buyers. Investors are awaiting further cues on the outlook of the global economy. The US and China, the world’s two biggest economies, have yet to solve their trade spats. 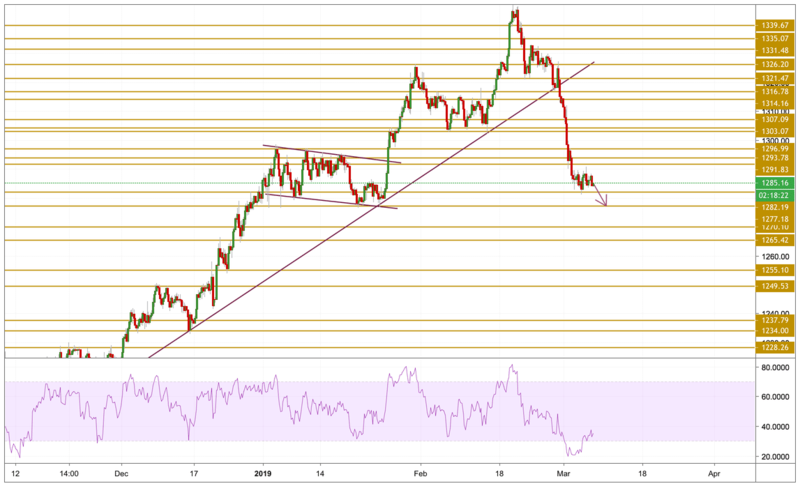 Gold prices entered into a consolidation as price is currently trading just above the $1285 level with a bearish momentum however very close to re-enter the oversold area indicated by the RSI. Technical indicators reflect the absence of buying interest for on the short-term, and therefore it is most likely that this bearish downward move will continue for now. Although there is a potential divergence with the momentum to watch out for which could cause a strong recovery. On the downside, the next level to watch will be the $1277.18 support level.